The oldest operating rollercoaster in Florida was a feat of engineering at its time – and still looks impressive. SPACE MOUNTAIN AT Walt Disney World in Orlando is one of the most nostalgic rides in America. Originally conceived by Walt Disney himself, the project was put on hold indefinitely after his death in 1966. The attraction was eventually given the green light in the ’70s, and astronaut Gordon Cooper joined the creative team to help make the roller coaster seem more like an actual space flight. Space Mountain was officially unveiled at the Magic Kingdom in 1975, and two years later at Disneyland in 1977. Today, it’s still one of the most popular rides and exists at all five Disney Parks around the world. Imagineering Disney, a blog run by writers who used to work at Walt Disney Corporation, received images illustrating the 1974 construction of the ride from Disney and shared them with Business Insider. See how the iconic ride was constructed below. Cinderella Castle rises in the background behind the construction site. RCA helped fund the construction and sponsored the ride for nearly 20 years. It was built outside the park’s perimeter, and initially accessible by tunnel. Space Mountain is the oldest operating roller coaster in Florida. The ride dome is 300 feet in diameter. The coaster’s steepest drop is 39 degrees. The ride was last revamped in 2009. Today it lasts 2 minutes and 35 seconds. 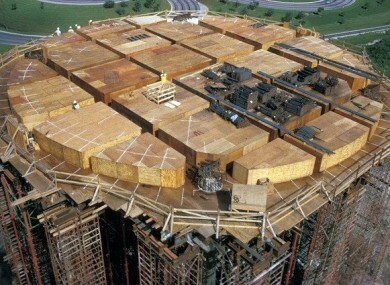 Email “Rare 1970s photos turn up of the building of Disney's Space Mountain”. Feedback on “Rare 1970s photos turn up of the building of Disney's Space Mountain”.